A young rugby fanatic from Beddau near Llantrisant was able to watch his favourite team, Cardiff Blues, perform in the annual Judgement Day event despite breaking his leg during a training session at his local rugby club recently. 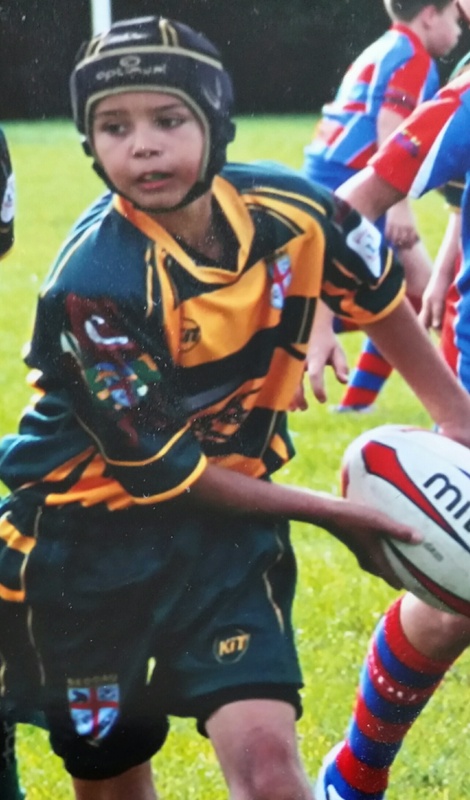 Nine year old Osian, who plays for the under 10s team at Beddau Rugby Club, sustained a spiral fracture of his tibia during tackle practice which left him in a full leg cast for nine weeks. Despite being provided with crutches by the local hospital, his Mum, Anne Nash, found that it was difficult for Osian to travel far and even fit into the car alongside his older brother and younger sister. The accident happened just a week before the Easter Holidays in April, and Osian had been looking forward to seeing his favourite team, the Cardiff Blues, take on Ospreys in the Judgement Day derbies at Millennium Stadium on April 25th. “We asked the hospital about borrowing a wheelchair and they suggested getting in touch with the British Red Cross. I gave the charity’s office in Newport a call and they said we could take a wheelchair straight away. It was very straightforward and everyone was really helpful” said Anne. The Red Cross mobility aids service helps people across Wales regain and maintain their independence after an operation, illness or accident by providing short-term loans of wheelchairs and commodes. Equipment is also available to purchase for those with longer-term needs. Anne continued: “Having the wheelchair was a huge help. It meant that simple things like going to the shops and attending hospital appointments were much easier. We were also able to take family trips during the school holidays to the beach and Roath Park in Cardiff. But the highlight was going to the Millennium Stadium to watch Judgement Day where we had a great view of the match. The mobility aids are loaned on a short term basis for to up eight weeks in exchange for a small daily donation to maintain the on-going provision of the service. The service can be accessed from the Red Cross mobility aids depot at Bradbury House, Mission Court, Newport NP20 2DW or local deliveries can be arranged. The depot is open Monday to Friday, 9am to 4pm. The Red Cross also sell medical and mobility aids including wheelchairs, commodes, bathing aids, walking aids and a wide variety of smaller daily living aids such as jar openers and stocking aids. Anyone interested in learning more about the Red Cross mobility aids service should call Sandra Watts on 0844 4122756 or email SWatts@redcross.org.uk for more information.